Benjamin Franklin’s “Pennsylvanian Fireplaces” were box-shaped, built of cast iron, and designed to be open-faced. Franklin intended for the Pennsylvanian Fireplace to warm an entire room, rather than just a small area like the conventional fireplaces of his time did. 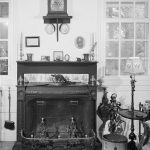 In order to accomplish this, the Franklin stove employed the use of a baffle, a device that captured some of the heat emitted from the fireplace. The baffle then propelled this captured heat into the room, thus warming the entire space. The Franklin stove was not a complete success, as the stove was prone to corrosion, was difficult to assemble, and proved to be quite expensive. 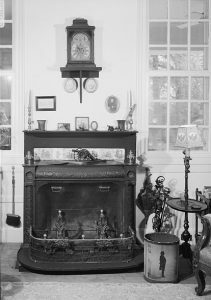 Eventually, the Franklin stove was replaced by the updated designs of David Rittenhouse’s fireplace. Today, genuine Franklin stoves are considered rare. Coal was an important resource used for home heating in the 1900s, and household owners would order coal in large quantities for stoves and fireplaces. Coal bootleggers sought to turn a profit from the booming coal business by concocting schemes that cheated customers. 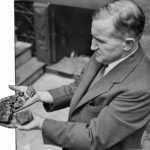 Bootleggers who distributed coal might insert common rocks into their coal shipments, deliver coal to consumers that did not meet certain size regulations, or deliver shipments that were listed as weighing more than they actually did. Inspectors and officials from the Bureau of Weights and Measures were employed to examine bootleg shipments and rectify the issue in the city. In 1934, officials of the Bureau of Weights and Measures met with members of the Department of Standards in Philadelphia’s City Hall and devised a plan to combat bootlegged coal and to stop short-weight coal shipments. Despite these efforts, the bootlegged mining and coal trade remained an obstacle for the city until 1941 when the importance of coal as a home heating fuel began to decrease. 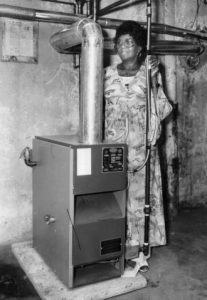 Home heating systems fueled by natural gas became available after World War II, but the natural gas systems became preferred over oil systems after oil prices rose in the 1970s. The price increases occurred after Arab members of the Organization of Petroleum Exporting Countries embargoed oil to countries like the United States that supported Israel during the 1973 Yom Kippur War. During that ensuing period, Philadelphia resident Mary Williams, seen in a photograph from June 1979, was one of many Americans whose furnaces were converted from oil to natural gas. Completed in 1943, the “Big Inch” pipeline was built to help bring petroleum from the southwestern United States to the East Coast. The twenty-four-inch-wide war emergency pipeline carried oil through the heartland from Texas to New Jersey. 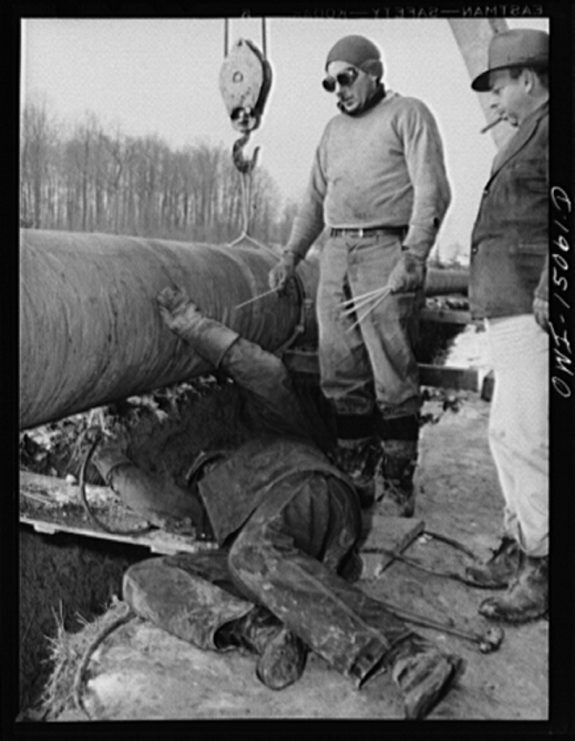 When the demand for gas increased in the United States after World War II, the Big Inch was modified to transfer natural gas to the Pennsylvania region. 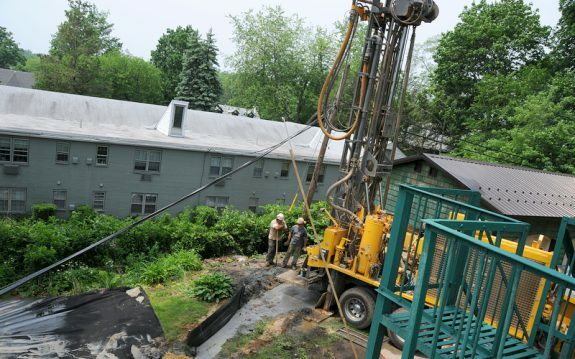 This gave Pennsylvanians energy alternatives to coal and allowed them the option to substitute gas for their oil-powered home heating systems. In the Philadelphia area, the history of home heating started with wood-burning fires then evolved with coal, fuel oil, and natural gas. Starting in the late twentieth century and gaining wider application in the early twenty-first, alternative "green" sources of renewable energy arose whose proponents sought to replace polluting fossil fuels. 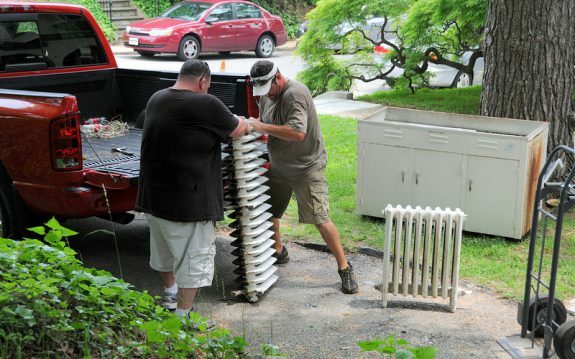 Scrap collectors prepare to haul off cast-iron radiators that were part of a heating system in a Victorian-era house in suburban Narberth. The radiators were part of an old heating system fueled by oil that was being replaced by a geothermal system for heating and cooling. The Delaware Valley’s frosty winters have always required residents to heat their homes for months at a time. At the time of the Philadelphia’s founding, the dense forests in its hinterland offered ample stocks of firewood—the region’s first home heating fuel. Anthracite coal from northeastern Pennsylvania began to supplement wood in the early nineteenth century and eclipsed it by mid-century. Coal reigned supreme for nearly one hundred years, replaced by oil, gas, and electricity only in the middle decades of the twentieth century. As the technological systems used to heat homes evolved, the sources of energy that households in the Philadelphia region used to stay warm changed as well, moving from local, to regional, and finally national fuel markets. English colonists to the Delaware Valley brought with them a preference for large, open fireplaces, which meant that as settlement expanded, so did the demand for firewood. Although some German colonists preferred burning wood in closed stoves, this had little impact on the region’s home heating markets. As a result, the fires burning in most colonial hearths were incredibly inefficient, as most heat disappeared up the chimney with smoke and soot. After more than a half century of depleting local firewood stocks, home heating fuel became a scarce commodity. In 1744, Benjamin Franklin (1706–90) published a pamphlet advertising his “Pennsylvanian Fireplace,” which claimed to burn firewood more economically, produce more even heat, and reduce smokiness. Eventually known as the “Franklin Stove,” this cast-iron inset for existing fireplaces achieved few of Franklin’s goals. Improvements by David Rittenhouse (1732–96) in 1784 helped reflect heat into interior rooms, yet the Rittenhouse Stove was expensive and difficult to install. In 1796 the American Philosophical Society sponsored a contest, complete with a sixty-dollar prize, for the best stove design to “benefit the poorer class of people.” Although intended for less-affluent consumers, the contest winners planned to charge ten dollars—a sum far beyond the budgets of poor Philadelphians—for their stove. As fuel scarcities became more acute, the ability to stay warm in Philadelphia’s frosty winters increasingly depended on a household’s income. The British blockade during the War of 1812 exacerbated firewood shortages. Jacob Cist (1782–1825) of Wilkes-Barre saw an opportunity and shipped samples of anthracite coal to Philadelphia, along with literature touting its many advantages as a home heating fuel. 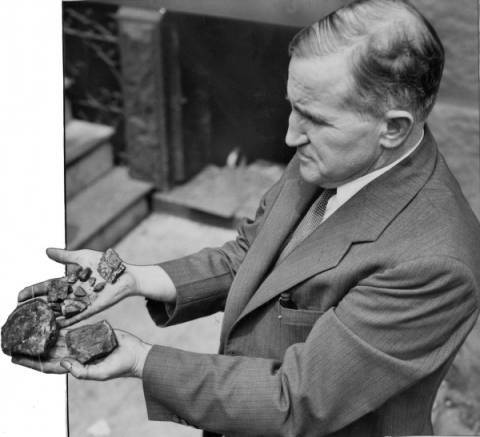 Although initially Philadelphians struggled to light this “stone coal,” anthracite eventually heated the homes of those willing and able to install a fireplace grate or stove designed for the new fuel. In the 1820s, two new canals, built by the Schuylkill Navigation Company and the Lehigh Coal and Navigation Company, connected Philadelphia to the anthracite region and dramatically increased the city’s supply of coal. As late as 1830, though, firewood still accounted for about two-thirds of the home heating market. A concerted effort by the city’s stove manufacturers to provide affordable coal stoves and philanthropic and promotional campaigns that touted anthracite as the “workingman’s fuel” combined to make “stone coal” the preferred home heating fuel by the advent of the Civil War. In fact, by 1860 anthracite met 90 percent of Philadelphia’s home heating demand. In the post–Civil War decades, a sophisticated network of fuel distribution developed in the region. Most coal arrived via water at the Schuylkill coal wharfs or via railroad at the Reading Railroad’s Port Richmond facility and then was carried by coal dealers to their small yards throughout the city. Dealers competed fiercely for customers, who often complained that they were swindled by unscrupulous dealers. Although retailers offered scales for weighing coal, many consumers doubted their accuracy. Despite calls for inspection and regulation, Philadelphia never provided much oversight of the coal trade, relying upon the market to drive out the worst coal dealers. As the trade had a low barrier to entry—a small coal yard and a delivery wagon—hundreds of coal dealers worked across Philadelphia by 1900. With razor-thin profit margins, the incentive for dealers to cheat customers was significant. 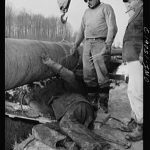 Although coal reigned supreme well into the 1940s, manufactured and natural gas, along with heating oil, eventually replaced mineral fuel in the region’s home heating markets. This meant that area residents were much more likely to manage home heating through a utility company than purchase, manage, and operate their own heating apparatus. In 1924, for example, the Philadelphia Electric Company introduced electrically driven oil furnaces on the market. By 1927 there were over twelve thousand of these furnaces at work in the city. Philadelphia Electric also sold gas furnaces to residential customers. Using heating oil became more cost effective for consumers after the completion of major pipelines, called Big Inch and Little Big Inch, linking petroleum fields in the Southwest with the East Coast during World War II. The expansion of the market for gas—mostly natural gas piped from the Southwest—occurred quite dramatically during the 1940s and 1950s, and by 1955 the utility was adding over ten thousand customers per year. Some local gasworks continued to make “manufactured gas” from anthracite coal, but national trends in energy markets undermined this source of heating fuel. The adaptation of Big Inch and Little Big Inch to transport natural gas to Philadelphia area in the postwar decades, in addition to the construction of new gas pipelines in the 1950s, linked the Delaware Valley’s refineries to national energy flows, as petroleum products from Texas and Oklahoma became cost-effective substitutes for Pennsylvania oil and coal. The rise in oil prices during the 1970s made oil furnaces less attractive, and by the beginning of the twentieth-first century, new methods of drilling for gas, such as hydraulic fracking, increased gas supplies. Still, oil furnaces persisted into the twenty-first century. No matter what method people in the Philadelphia region used to warm their homes, they found themselves less and less involved in the day-to-day decisions of which fuel to use, how much to purchase, or how to manage their apparatus. Heat became available at the turn of a dial and the original source of that energy was often thousands of miles away. Without the hassle of haggling with dealers, arranging for delivery and storage, and then managing their own furnace, the substitution of gas, oil, and electricity for wood and coal made sense for most households. In the post–World War II decades, for example, Philadelphia Electric alone served one hundred thousand residential natural gas customers, and home heating accounted for two-thirds of the company’s gas revenues. In the end, the convenience of getting heat on demand without worrying about coal prices, shady dealers, or how to operate their furnace outweighed any concerns local consumers might have about the origins of the energy they used to stay warm. Sean Patrick Adams is Professor of History and Chair at the University of Florida. He is the author or editor of several books, including Home Fires: How Americans Kept Warm in the Nineteenth Century (2014). Adams, Sean Patrick. Home Fires: How Americans Kept Warm in the Nineteenth Century. Baltimore: Johns Hopkins University Press, 2014. ________. “Warming the Poor and Building Consumers: Fuel Philanthropy in the Early Republic’s Urban North,” Journal of American History 95 (June 2008): 69–94. Binder, Frederick. Coal Age Empire. Pennsylvania Coal and Its Utilization to 1860. Harrisburg: Pennsylvania Historical and Museum Commission, 1974. Jones, Christopher. “The Carbon-Consuming Home: Residential Markets and Energy Transitions.” Enterprise & Society 12 (December 2011): 790–823. Jones, Christopher. Routes of Power: Energy and Modern America. Cambridge, Mass. : Harvard University Press, 2014. Powell, H. Benjamin. Philadelphia’s First Fuel Crisis. Jacob Cist and the Developing Market for Pennsylvania Anthracite. University Park: Pennsylvania State University Press, 1978. Wainwright, Nicholas. History of the Philadelphia Electric Company. Philadelphia: Philadelphia Electric Company, 1961. “Article on Warming Rooms” (March 7, 1791), “On Fireplaces” (October 16, 1796), and “Description of a Stove” (November 3, 1797), American Philosophical Society Archives, 104 S. Fifth Street, Philadelphia. Papers Pertaining to the Purchase of Fuels (February 10, 1816, to September 29, 1847), American Philosophical Society Archives, 104 S. Fifth Street, Philadelphia. Union Benevolent Association Records and Wurts Family Records, Historical Society of Pennsylvania, 1300 Locust Street, Philadelphia. Pennsylvania Power & Light Company Collection and Philadelphia Electric Company Records, Hagley Museum and Library, 200 Hagley Creek Road, Wilmington, Del. Winterthur Museum, Garden & Library, 5105 Kennett Pike, Wilmington, Del. Mercer Museum, 84 South Pine Street, Doylestown, Pa.
Anthracite Heritage Museum & Scranton Furnace, R.D. #1, McDade Park, Bald Mountain Road, Scranton, Pa. Very interesting article. I think many people have wondered how heating their home evolved from the simple fireplace. I loved this essay. How could I not? It’s a hot topic! I hope a future essay explores the divergence of appliances used for heating from those, like stoves, also used for cooking. Victorian Philadelphians complained about smoke and cooking odors through the house from basement kitchen stoves.